A whole week has gone by and still no more news on the house sale. Even though original buyer is back and "really wants" the house there is no clear answer to our question over why on this planet we are still waiting for the sale to go through. Whilst all this nothing is happening the house we want is back on the market enticing other potential buyers, we feel sickened over the big fat bill we'll have to pay for nothing if we don't get it. Even in all the tediousness of being messed around with the house I feel so blessed and relieved that I've gone from having no job to having four just when we needed it, it's going to be another fun tax return, ha! I've been teaching, tutoring and trying to remind myself of the creative life with some jewellery making and some experimentation in clay and we had an ace day out with a friend who took us on a tour of the nature reserve he works on - more on those joys later. 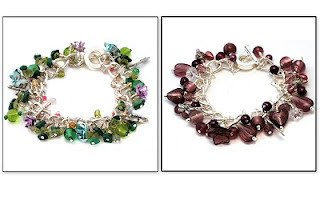 Bringing some cheer with 'The Secret garden' inspired jewellery! I had managed to not to annoyed during the week and even had a lovely early morning swim on Friday as I wasn't teaching that day. Perhaps because I had a day doing my own work the frustrations have built up on the heaving realisation that by now I should have been doing this as full time as possible and that even though I still have a few boxes of tools and materials here everything else is in storage until we move. So I find on this grey wet old Saturday I'm a bit fed up and am quite frankly going to plop myself down in front of the rugby for the afternoon, harumph! I wonder if we have any crisps . . . ?